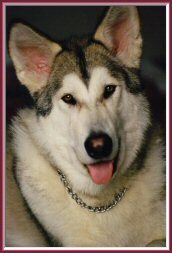 Many different cultures believe when animals cross your path, they’re bringing a message to share with you. The Cherokee belief that Red Tailed and Red Shoulder Hawks are messengers of vision. When you see one of these beautiful birds, what ever it was you were thinking about at the time, is happening around you or it’s going to come true and manifest in your life. It takes a lot of energy to flap wings and move a large body into higher flight. This is why you often see a kettle of Turkey Vultures soaring in a circle together. They are trying to catch the thermal and use the warm air for lift. Yes a flock of Vultures in flight is called a kettle. While a committee, volt, and venue of vultures refer to vultures resting in trees. A wake is reserved for a group of vultures that are feeding. 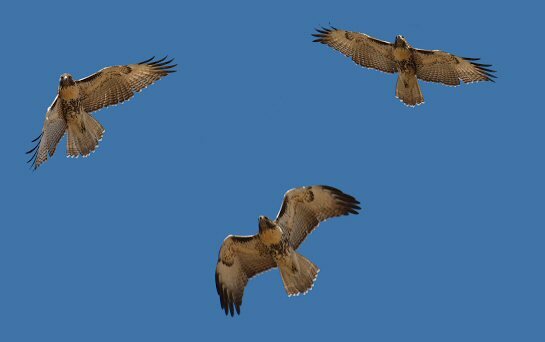 Like most large birds, Red Tail/Shoulder hawks look for these same warm updrafts to help them gain lift and rise up into the sky. While it’s common to see Vultures together like this, it’s extremely rare to see three Red Shoulder hawks flying together as they try to catch a thermal to rise up over the landscape. This is known as a boil of hawks (two or more spiraling in flight), where as a flock of hawks is referred to as a cast, or a kettle (flying in large numbers). Hawks in general are solitary birds. Meaning you rarely see them flying together. You might see a mating pair during mating season. But generally one of the pair is building their nest, tending eggs or protecting their young, while the other is off hunting. It’s very rare to see them flying together during other times of the year. And even more rare to see more than two of them together in flight. The Nature Scientists say, this happens on purpose and for good reason. The hawks watch each other move through the air flow to help determine who found the warm current. In this way they maximize their ‘hunt’ for the thermal and use less energy trying to maintain flight by flapping their wings. Today on my way to pick up the Prince from school, I saw a Red Shoulder hawk flying over a corn field. The only reason I know he was a Red Shoulder and not a Red Tail was simple luck and the way he was gliding when I caught sight of him. Had I not seen his tail, I wouldn’t have known. I was able to watch him long enough to determine he was hunting. My guess, he saw a field mouse and was honing in on capture. On our way back, we saw another hawk in another field, taking off with something in its claws. Had he not flown past the front of our car, we wouldn’t have known that he too was a Red Shoulder Hawk. But it was another interesting sighting. When we finally got back to the lake, we turned a corner to one of the common areas when I caught sight of two hawks soaring by. I slowed down to get a good look and there was the third bird. They were flying in a circle, so it was obvious they were looking for a thermal. And they were close enough to see they were Red Shoulder hawks. With cars coming we couldn’t stop and take a picture, but we traveled on and stopped in the turn around by our drive way. 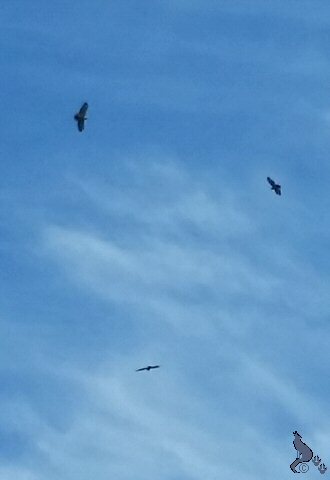 By that time they had really moved up into the sky, but I was at least able to get a picture of the three of them together. It was rather exciting! At least it was to me. Ted Andrews is one of the foremost authorities on animal sign. In his book “Animal Speak” (you can find it on Amazon), he says this about Red Tail/Shoulder Hawks. I’m not going to share the entire entry from his book, but only the pieces that I think applied to our visitation. Note: In his work Ted links the Red-Tailed and Red-Shoulder hawks as brothers. Their message is typically the same. For that reason you’ll see “Red-Hawk” in the text below, referring to both forms of these hawks. “Red-Hawks are occasionally harassed and attacked by smaller birds. This is very significant for those of you who have a red-hawk as a totem. It indicates that there are likely to be attacks by people who won’t understand you or the varied and different uses of your creative energy. They may attack your ability to soar. The red-tailed and red-shoulder hawks are usually permanent residents in an area, although occasionally they may migrate. This permanency reflects that as a totem, these red-hawks will be with you permanently once it shows up. It is generally accepted that red-hawks mate for life. Both the male and female help care for the young. Two to three eggs are laid in the spring. They vigorously defend their nests against any intruders. They cling to their home territories for years. And they can live up to 14 years in the wild. This “14” is significant. The 14th card in the tarot deck is the card for Temperance. This is the card that represents the teaching of higher expressions of psychism and vision. It can be used in the development of astral projection–new flights out of the body. It has ties to the activation of your vital energies (kundalini), and the bold expression of it. It is tied to the archetypal forces that teach beauty and harmony in moderation. It holds the keys to higher levels of consciousness. Rising to a higher level can bring a rapid development of the psychic energies. The red-hawk helps us in balancing and using those senses appropriately. It teaches the balance necessary to discover our true purpose in life. 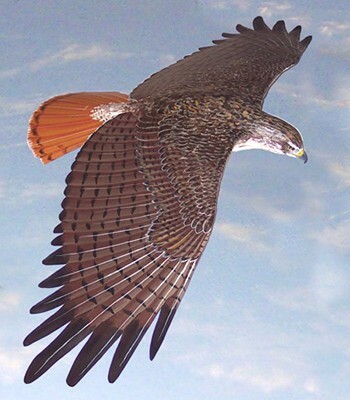 If you have a red-hawk as a totem, meditation on the 14th tarot card will help you to see how this hawk will lead you to use your creative energy in manifesting your soul purpose. The red-hawk reflects a greater intensity of energy at play within your life. It reflects an intensity of physical, emotional, mental, and spiritual forces. This bird is the catalyst, stimulating hope and new ideas. It reflects a need to be open to the new or shows you ways that you may help teach others to be open to the new. To the Pueblo, the red-hawk was known as red eagle. Its feathers and energies were used in healing ceremonies and for bringing the rains and waters necessary for life. To the Ojibwa, the red-hawk represented leadership, deliberation and foresight. “Red-Hawk is akin to Mercury, the messenger of the gods. Hawk medicine teaches you to be observant…Life is sending you signals.” The red-hawk can spread its wings to a great width, and it can teach you to use your creative energies in the same way. It can extend the vision of your life. There’s so much in Ted’s message that interest me. 14 is an important number in my life. If you’ve visited my blog, you know I’m a fan of Tony Stewart who drives the #14 Chevy for Stewart-Haas Racing. 4 is also my favorite and lucky number. Two connections that link the lifetime of the hawk with my life interests. Connecting that number to the Tarot again gives a connection to my life. Not only is that my favorite tool for divination, but considering I draw a card every weekday and share its message, it links the teaching of higher expressions to my daily world as well. Then there’s “Red-Hawk is akin to Mercury, the messenger of the gods.” As a Gemini, our ruling planet in the Zodiac is Mercury. This probably isn’t a coincidence. Since I don’t believe in coincidence than I’m pretty sure this connection makes the message from the red-hawks today even more viable. Each of these insights connect to a current struggle we’re dealing with. One that has put an unbearable amount of stress on our entire family. I don’t think it’s a coincidence that the Prince and I saw the boil of red-hawks here by the house either. The message that “red-hawk is usually a permanent resident in an area” is of great interest as this is the main issue of worry right now. Neither the Prince, nor I want to leave our home here on the lake. But it seems we’re constantly fighting against those who are trying to force that to happen. Those who move around a lot, or have moved often may not understand the feeling of security and connection of being in one place. Home means different things to different people. It’s not simply a place to hang your hat, nor does “Home is where the heart is” apply. To many Home is a place you feel connected to, rooted to and safe in. Take that away and you may as well rip out the heart while you’re at it. It’s not simply a building or a place. Seeing the hawks today sent some interesting messages our way. But they leave a lot of questions left to be answered. They didn’t take away the worry or the stress. Though they did remove some of the defeated perspective. Thank you Hawks, for visiting today. 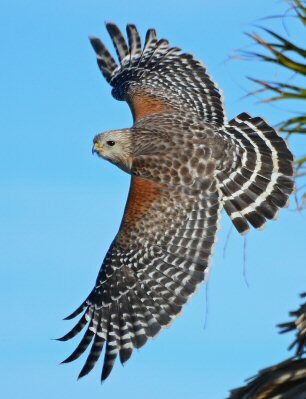 Thank you for this post of encouragement and faith, from the red shouldered hawk. Just what I needed to hear today.